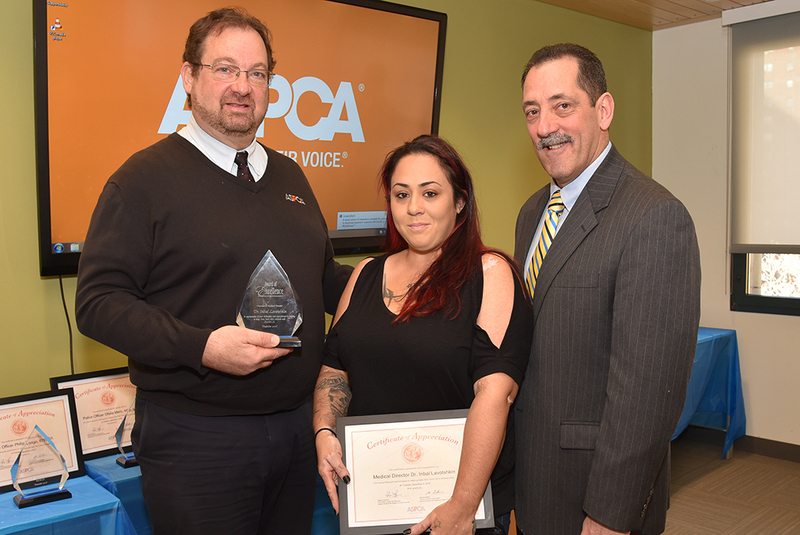 This week, the ASPCA honored 14 members of the New York City Police Department (NYPD), three prosecutors and one veterinarian for their tireless efforts to help animals in New York City through the NYPD/ASPCA Partnership. 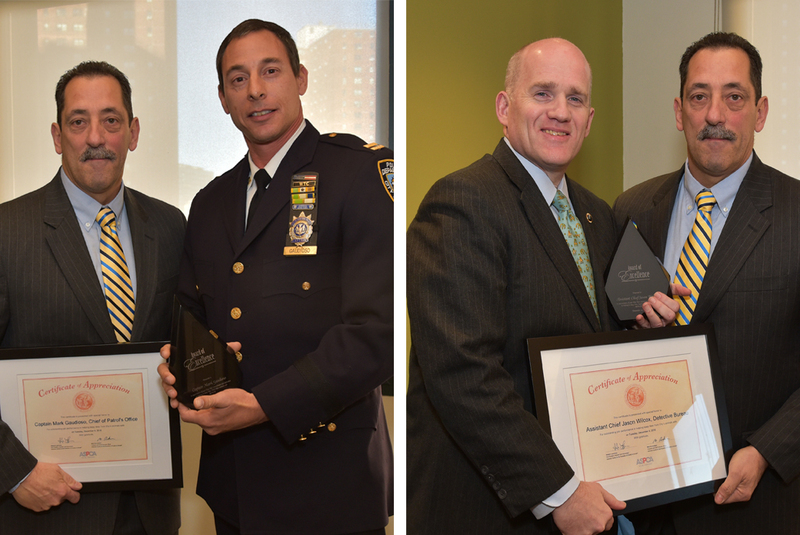 As we mark the conclusion of the fifth year of this important partnership, we also recognized two NYPD leaders—Captain Mark Gaudioso, Chief of Patrol’s Office, and Assistant Chief Jason Wilcox, Detective Bureau—among this year’s awardees for their support and hard work over the past half-decade. Captain Mark Gaudioso (left) and Assistant Chief Jason Wilcox (right) with Howard Lawrence, Vice President, ASPCA Humane Law Enforcement. 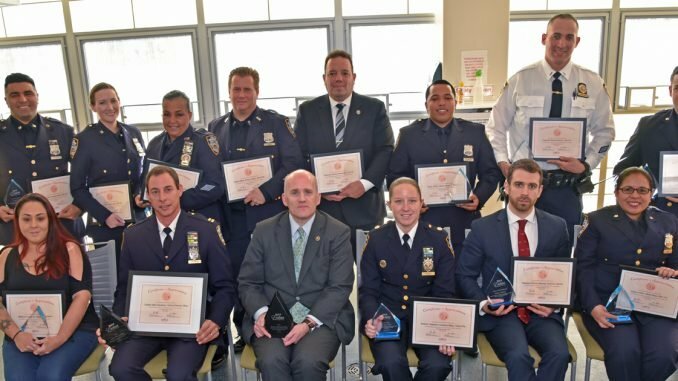 The honorees attended the annual celebratory luncheon held at the ASPCA Adoption Center and were given appreciation awards for their roles in preventing, investigating and prosecuting cases of animal cruelty and neglect in 2018 and providing critical care for victims—roles like that of Police Officer Alberto Guzman who helped rescue 33 Shih Tzus from deplorable conditions; Police Officers Lori Murray and Daniel Pardo, who, through quick thinking and excellent police, work rescued a local dog who was being threatened and held for ransom; or Assistant United States Attorneys Michael Longyear and Stephanie Lake, who prosecuted the first-ever federal dogfighting case to go to trial in the Southern District of New York, ultimately finding justice for 17 abused dogs. 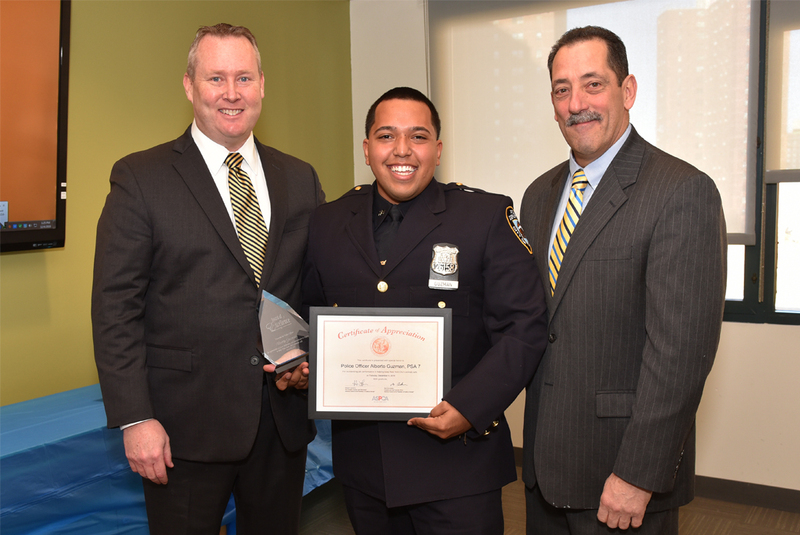 Police Officer Alberto Guzman with Howard Lawrence and Michael Mugan, ASPCA Law Enforcement Liaison. Police Officers Lori Murray and Daniel Pardo with Howard Lawrence and Michael Mugan. Assistant United States Attorney Michael Longyear with Howard Lawrence and Elizabeth Brandler, ASPCA Legal Advocacy Senior Counsel. In addition, this is the first year the ASPCA honored a veterinarian, Dr. Inbal Lavotshkin, from one of the eight 24-hour veterinary hospitals in NYC that partner with the ASPCA to provide critical care for animal cruelty victims during evening and overnight hours when the ASPCA Animal Hospital is closed. Shevonne Johnson of VERG on behalf of Dr. Inbal Lavotshkin with Howard Lawrence and Dr. Robert Reisman, ASPCA Forensic Sciences Supervisor. Launched in January 2014, the NYPD and ASPCA citywide partnership continues to have a considerable positive impact for New York City’s vulnerable animals. 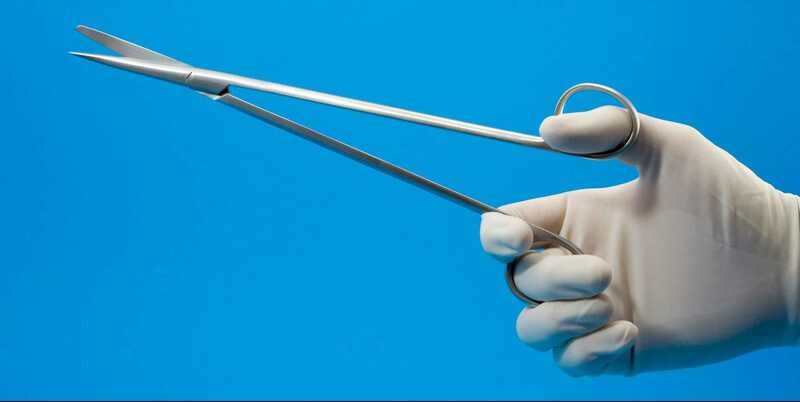 Since its launch, more than 3,200 animals have been treated through the partnership. We look forward to seeing continued success in helping rescue and protect those who need us most through our critical work with the NYPD.